Back in 2008— master distiller Desmond Payne would craft a gin that would be among the most inventive of its days. There are twelve botanicals. They are macerated together for twenty four hours (as are the botanicals in many other Beefeater Gins; however, in this case Beefeater 24 gets its name from this maceration time). But what really was unusual about Beefeater 24 was Payne’s selection of teas as its signature botanical. Sencha is a Japanese green tea renowned for its vegetal and grassy flavor. It’s by far the most popular tea in Japan. With some studies saying nearly ¾of all tea drank in Japan is of this type. Although similar in that its also a green tea, Chinese green tea is sweeter and a bit brighter. Desmond Payne has been quoted on the record as saying that the choice of Green Tea leaves was intentional— because they are steamed right after harvesting, they don’t have any of the oxidized notes that other types of tea may have. The nose of Beefeater 24 will call to mind the nose of— Beefeater Gin. Citrus, juniper and the slightest hint of licorice root beneath it. The citrus is a bit more bright and at the fore. Seville Orange zest lends Beefeater 24 a note that reminds me of Chase’s Seville Orange Gin. To the palate, you’re going to early get a gin that is reminiscent of other gins in the Beefeater line. 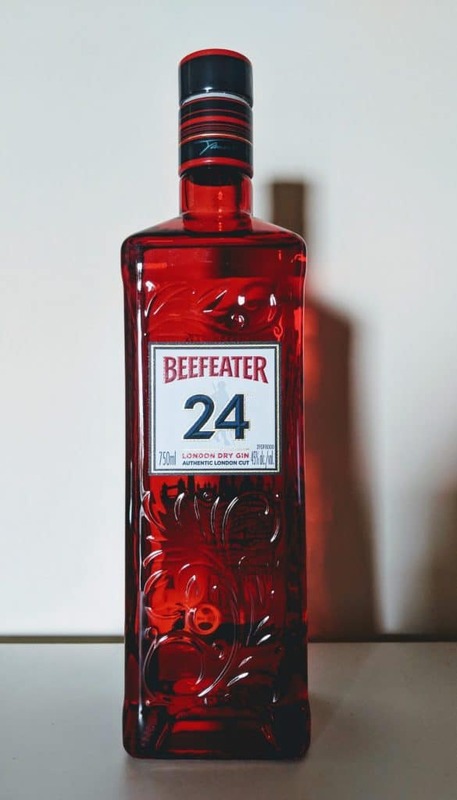 Beefeater 24 is quite pleasant with sweet citrus, including notes of lemon rind and sweet lime— that moves into a mid-palate with juniper. Though less juniper-forward, the juniper is still here and remains the gin’s centerpiece. The finish is where Beefeater 24 is quite different. Long and dry, there’s a grassy, vegetal note of warm green tea. It’s a bit more astringent and tannic than your standard Beefeater. Taste-wise, if you’re following gin trends in the late 2010’s, you’ll notice a lot of taste similarities between some of the new gin releases out of Japan. Beefeater 24 works quite well as a classic style gin in mixing. I think the green tea notes are less successful in drinks like the Ramos Gin Fizz or other creamy fizzes. I find that the longer, more astringent finish adds complexity in cocktails with bitter and herbal counterpoints. Try it in a Dry Martini with an Olive. The Seville Orange nose is a nice counter point to the vegetal brine notes of a pickled Onion in the Gibson. Overall, bartenders and home mixologists will find Beefeater 24 a versatile mixer with a point of difference on the finish. What was a startling contemporary style gin upon its launch now comes across as rather traditional. But that’s no criticism of Beefeater 24. Beefeater’s premium offering is still an exceptionally well-made gin with wide appeal. Fans of Japanese gins looking for something a bit more widely available will find Beefeater 24 a prescient substitute. Overall, it’s as worth checking out today as it was upon it’s launch over ten years ago.